There is no sport like swimming. It works out your entire body and you burn upto 500 calories an hour. However there are many people who are not such great swimmer yet still go to the swimming pool to work out and get fit. Sometimes we feel like we are wasting our time at the swimming pool because we don't know how to swim that well and are not burning any calories. Yet you are mistaken. Despite not being a strong swimmer or a swimmer at all, you can still go to the swimming pool and do some exercises which will tone your body and help you get the body you want. 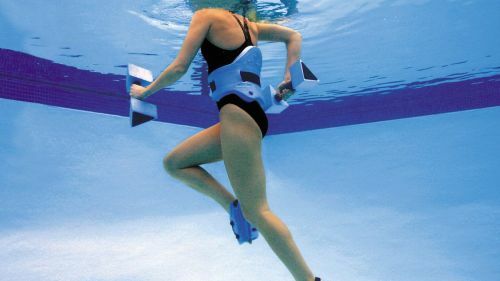 Doing exercises in the pool are extremely easy and injury proof as well! Since the water is wear and tear resistant. Thus here are some exercises to do in a pool if you want to get that toned body. Water Jogging is one of the most effective ways to lose weight and tone up. The water provides enough resistance to make it strenuous but is still wear and tear resistant. Water jogging works out your entire lower body; your thigh muscles, quadriceps, hamstring and calves. And along with the lower body it tones your core muscles: abdominal area and obliques. One should do water jogging for anything between 10-20 minutes. Now on land kangaroo jumps are fairly hard to do, but since in the water your weight is minimal, a kangaroo jump is fairly easy. A kangaroo jump is when you jump in a manner that your knees come close to your chest. A kangaroo jump tests your explosive power and your core strength. Thus it tones your abdominal area and your obliques. They are also a great way of working out your calves.